Instead of dying off, Diablo spreads its wings. The presentation of Diablo Immortal at Blizzcon over the weekend was not handled well. Blizzard tried to cool down speculation before the conference, but it has been more than four years since Reaper of Souls and fans were naturally hoping for a glimpse of something, anything, to indicate that the main PC series is alive and well. 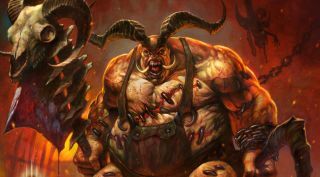 Blizzard has said repeatedly that multiple Diablo projects are in in the works, but statements around a conference don't have the same cut-through as a guy nervously addressing Blizzard’s most devoted fans at the climax of Blizzcon’s opening ceremony. I get the disappointment. The lavish cinematic trailer got me excited for the prospect of a big new PC Diablo game, and the sudden reversal of that expectation is one of the reasons why that cinematic trailer has nearly half a million downvotes right now. All flee before the Lord of Terror. Image via Amazon. Diablo and Tyrael Funko Pops were announced in 2013. A year later Reaper of Souls came out and Reaper of Souls was great. The existence of fridge magnets, beanie hats, beer glasses didn’t appear to have any impact on the main game or its appeal. Malthael was as cruel and gothic as you’d hope from an angel of death. Westmarch was full of monsters to punch. It was good Diablo times. Since then Diablo has appeared on consoles, including the Nintendo Switch, which supports the game quite nicely and offers offline play for long journeys. Now the company wants a mobile game that can appeal to more players, and there's even a chance it might be fun to play and show off some interesting new parts of Sanctuary. Blizzard is a global business that wants its properties to make money in markets all over the world. If the series is able to make money in a wide variety of ways Diablo becomes a going concern, and there’s more reason to produce core games to sustain it. Plus, parallel mobile games are increasingly common. Fallout 4 and Fallout Shelter happily found their own audiences. But why couldn’t the company just announce a new core game? Obviously if it exists it isn’t ready for the public, which suggests such a game is quite a way off. Plus, Blizzard may be thinking about Diablo 3, which was announced far too early. There were plenty of development blog posts that ended up causing disappointment when features were cut or changed before release. If you announce a game years and years before launch, an audience can tire of it before it even arrives. Not that Diablo fans aren't sick of waiting. This weekend's disappointment also stems from prolonged silence from Blizzard about the future of the series, even just to say that the Diablo has a future beyond D3 seasons and the Necromancer pack. We saw some hiring for dungeon artists and designers in 2017, but otherwise it's natural to worry that the success of games like Overwatch could change a company's priorities. In truth that's a much greater risk for the series: that it stops being worth pursuing at all above Blizzard's other games. A mobile game as part of a collection of new Diablo projects should be seen as a sign of life, not of the series' imminent death. Because a series is expanding, it doesn't follow that the PC games that started it will be undermined or somehow lost, it just means we need to wait a little longer for the game we really want.